Megan Adams is a Certified BodyTalk Practitioner, Akashic Records Reader and Intuitive Healer. Megan Adams has worked with clients for over 10 years shifting from marketing/business consulting to a full-time healing practice, Soul Speak Wellness located in El Dorado Hills, CA while working with remote clients all over the world. Megan has over 5 years of experience in the field of energy work and healing practices as a practitioner, Akashic Records reader, Shamballa Master and over 10 in being a business owner. Megan is also working towards her BodyTalk for Animals certification and is an animal communicator. She has had the privilege of participating in the Indonesia Practitioner Development Project spending a month in Indonesia (February 2016) learning from Loesje Jacob, Sr. CBP how to work with animals in a BodyTalk context, and visiting local orphanages, hospitals, vet clinics and sanctuaries to put the modalities into practice. She went back in January 2017 to deepen her understanding and receive teachings from the animals there visiting the Asian Elephants in Way Kambas National Park, Sumatra and the Orangutans in Tanjung Puting National Park, Borneo. In her sessions, Megan works with your body and soul’s innate wisdom to restore balance and harmony on all levels. Her true passion is helping her clients uncover their true potential and shed the belief systems that hold them back. Drawing on her extensive knowledge as a business owner & marketing consultant, Megan is able to bridge the esoteric with practical business information, helping you fit all the pieces together to help move your life, business or project powerfully forward. In an effort to understand the patterns that reoccured in her clients and to help guide them through their blocks, Megan started to integrate various consciousness-based modalities and techniques in her consulting, some of which include BodyTalk, Shamballa and the Akashic Records, into her work with her clients. She now is moving towards working exclusively in a healing capacity for people, animals, plants and businesses. 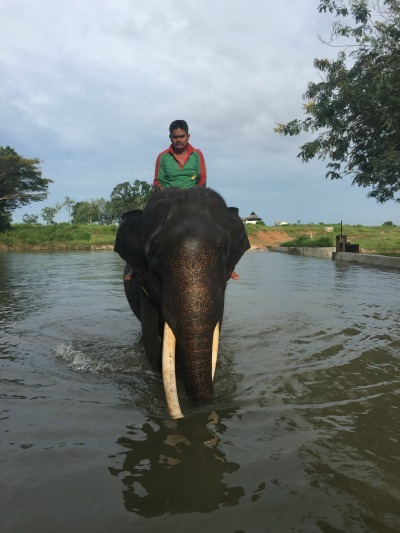 Majestic elephant and his mahout. Way Kambas National Park, Sumatra, Indonesia, February, 2017. Indonesian Practitioner Development, February 2016, Animal Sanctuary Trust, Malang, Indonesia. Megan graduated West Chester University with a Political Science degree in 2005 and quickly entered the corporate world working in a Project Management role. In 2009 she was unexpectedly let go from her full-time job, leaving her searching for more meaningful and purposeful work. Megan was accepted into Alberta’s Small Business Entrepreneurship program where she sharpened her small business skills on a grocery delivery business called, Grocery Gopher Girls. The marketing aspect of the business was what ended up thrilling Megan, and that’s when her momentum and the Universe’s plan aligned. Meg the Media Maven (now Soul Speak Marketing) was born and Megan found herself in the front lines of running a marketing and social media consulting business. At the same time, Megan was divinely guided to begin exploring other energy modalities and that’s when she met Garry Belleau, owner of Ascention Aromatics in Calgary. The rest of her soul family slowly began to show up and Megan started truly exploring her spiritual path with the guidance of her mentors, friends and etheric guides. It was no coincidence that majority of Megan’s clients were involved in consciousness-based and metaphysical modalities. Megan was so honored to work alongside these beautiful forces of nature following their life’s paths while assisting them to reach their goals and learning all they had to share. Meg the Media Maven never felt like a job. It was a mission to help all those heart-centered beings with BIG missions get their message out there and be seen. To many, the marketing and business side was daunting but to Megan it was invigorating and critical. Megan is here to get her clients SEEN. To get their message to those that need to hear it. And to all those that need to play a bigger game but don’t know how. Fast forward to May 2014 and Megan attends the most pivotal course of her life: Linking Awareness, Intercellular Communication with Loesje Jacob. It was in this course that Megan became attuned to communicate more clearly with her Higher Self, Guides and the Animal Kingdom. It was also Loesje’s instruction that led Megan to work towards her BodyTalk certification. Megan spent 2-weeks in December 2015 in South Africa, living on the Kaapsehoop Horse Trails ranch among the wild horses of Kaapsehoop and connecting with and learning from the animals in sanctuaries like Chimp Eden, the elephants at the Hazyview Elephant Sanctuary and connecting with Linda Tucker and the The White Lions of Timbavati. 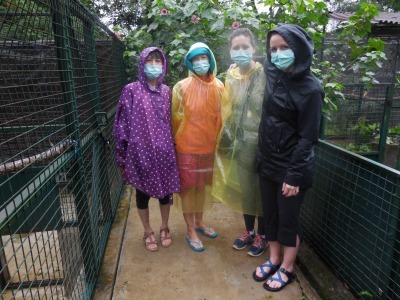 Megan returned home (changed) and was called to spend a month in February 2016 in Indonesia with the Linking Awareness team and dozens of International students, Indonesian students and vets and others learning BodyTalk for Animals and other courses while practicing hands-on in zoos, vet clinics, sanctuaries, hospitals and orphanages. The profound experience of Indonesia is still one that Megan has trouble explaining. Megan has worked with clients for over 10 years in both a marketing/business consulting capacity and 5 years in a healing practice. During the near decade of working with entrepreneurs and small business owners, Megan started identifying recurring themes that would come up for her clients. Issues around confidence, self-worth, finances and fear of putting themselves out there would appear and halt or derail the momentum they had built. In an effort to understand why these patterns consistently came up and in order to help move her clients through these emotional blocks, Megan started to integrate various consciousness-based modalities and techniques, some of which include BodyTalk, Shamballa and the Akashic Records, into her work with her clients. This holistic approach allows her to help transition clients from a state of ordinary human consciousness to a state of Universal consciousness so that they may be enlightened to their own soul’s journey and purpose. With a core belief that she is here to be of service, Megan uses her business savvy, marketing know-how, healing abilities and heightened intuition to fully support her client’s in achieving their own business and life goals – AND feeling better!